( January 8, 2015, Chennai, Sri Lanka Guardian) There is a systemic crisis in Sri Lanka and the advanced stage of the cancerous polity will climax in the near future. The post-independent polity in Sri Lanka was never allowed to form itself. The moral is about the social and political consequences of destroying freedom and justice. The idea of force cannot be the foundation of political legitimacy forever which successive Sri Lankan governments have relied for long since independence in 1948. It was constantly attacked by the acts of ‘Sinhala Only.’ The moral conditions required for the survival of plural society and democratic polity do not exist any longer in Sri Lanka. The rise of barbarous state and self-acknowledging devils competing for power are concurring signs of this tragic reality. 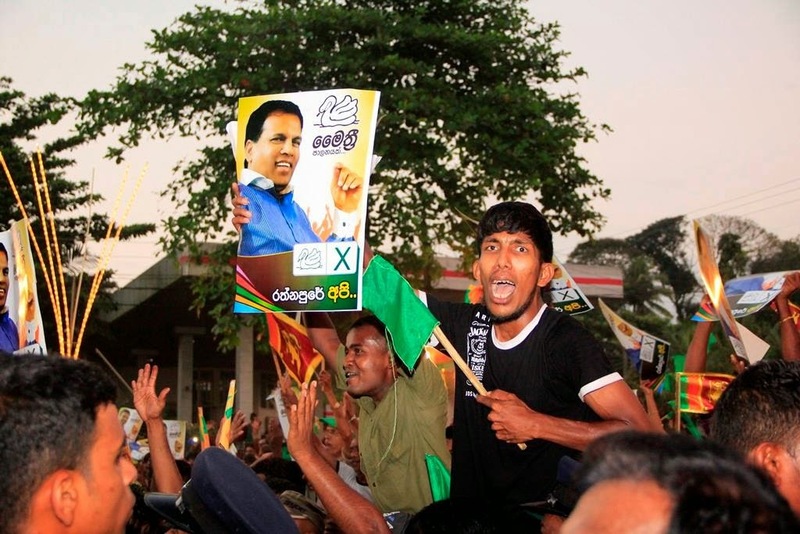 The presidential elections-2015 held two years ahead of schedule not only reflects the greed and brutal selfishness of the current president Mahinda Rajapaksa but also the fragile course and destiny of the polity. The common presidential candidate Maithripala Sirisena is not from another planet but comes from the same government as an erstwhile trusted colleague and Minister for Defence during the Mullivaikal genocide of Tamils in May 2009. Both Rajapaksa and Sirisena are battling this time without an option of returning to what sells like a magic cure for all illness among the Sinhalese voters – the hatred for Tamils and the LTTE factor. They both are pretending and praying for salvation through power but with the Tamil votes. The enemy factor is no longer the determining cause of the electoral outcome this time. There are more significant realities revealing that Rajapaksa has been surrounded by challenges and without any hope of electoral success. All roads to safety are closed both at home and abroad except for the Chinese whisper which can be interpreted anyway as the wind blows. Rajapaksa has been forced to fight with the courage of despair. This situation not only makes him more desperate but will leave the country in tatters and with a rare constitutional coup. There are genuine concerns about the possible abuse of government machinery, role of police and the control of media. At the same time, there are naïve and pacifying voices aired to soothe the fears of potential threats from the military in North & East of Sri Lanka, particularly in areas where Tamils live in large numbers. The point is that the Sri Lankan armed forces have been cultivating food and vegetables in the military occupied agricultural lands since 2009. The military has been also been selling them with select outlets. Everything from a private ceremony to transfer of a peon functioning within the premises of the Northern Provincial Council Chief Minister’s office has come under the hammer of the army. The Chief Minister of the Northern Provincial Council cannot even visit a government school in North without the consent of the military. How can anyone not expect that the Sri Lankan armed forces will not have any role in the presidential elections? The opposition parties have complained recently that the military has set up 400 roadblocks to deter minority Tamils from voting in the North. Did the opposition ever try to find out how many roadblocks were there for the Tamils during the civil war period and after the war since May 2009? There are many questions before the Tamil voters. What is the meaning of this presidential elections-2015? How different is this from the previous elections since 1977? To what does it lead? Is this an isolated exercise, without any connection to the reality of their lives? Does it not conceal or does it not reveal a destiny beyond the mirage of democracy in Sri Lanka? Tamils are under no obligation to rescue either Rajapaksa or Sirisena because of the fact that they have resigned themselves to a pitiable silence. More than 80,000 Tamils have died and 1, 46,679 Tamils have disappeared during the final years of the brutal civil war. There are at least 1,75,000 Tamil asylum seekers languishing around the world as on December 2014. This figure does not include the registered refugees. Given the waves of Sinhala colonization in Tamil areas and the rapid militarization of North & East since May 2009, Tamils have no choice but to seek international attention towards political solution to the ethnic conflict in Sri Lanka. In view of the ongoing international investigations into the war crimes and crimes against humanity committed by the Sri Lankan armed forces and government authorities, the demand for political solution includes the right to self-determination and the call for UN monitored referendum. Sri Lanka is moving towards a major constitutional breakdown with a political deadlock arising from the electoral outcome that will be withheld indefinitely without an execution of the will of the mandate. After phasing out Sarath Fonseka with intimidations and safety deal, Rajapaksa does not foresee any immediate threat from the military ranks. The revamping of the power structure within the military, since the unceremonious exit of Sarath Fonseka, has been taking place with the knowledge and maneuvers of Gotabaya Rajapaksa. But this arrangement cannot be trusted for a long term political role and, thus, military intervention at this stage will not be favourable for Rajapaksa. Hence the Pakistan model of military intervention inspired by the brew at the top can be safely ruled out. Neither Burmese model of military uniformed coterie reigning nor the Ershad model of drag democracy in Bangladesh are likely conditions in the near future. The dissent among the soldier class is unlikely to cause a political tornado but for their traditional loyalty and votes to Janatha Vimukthi Peramuna (JVP). India is certainly not available for repetition of the rescue act through ‘Operation Cactus’ in the 1988 Maldives Coup d’etat to stabilize the sinking reign of Maumoon Abdul Gayoom with a planted coup. In the alignment of international support for both the presidential candidates, Rajapaksa considers the Chinese support as an outlet for his potential survival as he is exploring his way out of adverse realities surrounding him. It may go unnoticed as he reiterates that ‘he would not allow the country to be divided and Western governments want him out as he refuses to bow to their pressures’. This is a sufficient recipe, along with the Chinese backing, for an Asian dictator to survive the tremors of politics. He is more than desperate and after careful consideration and counting of costs he knows his strengths and limitations. He has not advanced the presidential elections two years ahead of schedule to go home early. Though Rajapaksa does not possess civic virtues, he will choose the civil sphere to protract the political battle with the help of radical Buddhist outfits. Given the history, the consent of the Sinhala masses can be mobilized with the combination of theocratic despotism of the Buddhist clergy and constitutional despotism steered by the traditional political elites of Sri Lanka. A further collapse and deterioration of Sri Lankan polity is inextricably linked to the chances of his destiny as the constitutional despot. The moral is about the social and political consequences of destroying freedom and justice. The idea of force cannot be the foundation of political legitimacy forever which successive Sri Lankan governments have relied for long since independence in 1948. Rajapaksa believes that he possesses political resources equal to the strain of establishing his rule through constitutional despotism in the close proximity of his brother Gotabaya Rajapaksa toying with the military. The excessive concentration of power at the centre of political society or in the hands of a family or an individual is, in the long run, its own undoing. Sri Lanka is, thus, likely to enter into a new political zone of constitutional despotism as an aftermath of the presidential elections-2015. There will be long nights with little or no day light. We must then learn to wait for the transitions that will emerge as an undying course of politics.